-It is necessary for Christmas Day, highlighting the happy atmosphere of the festival. 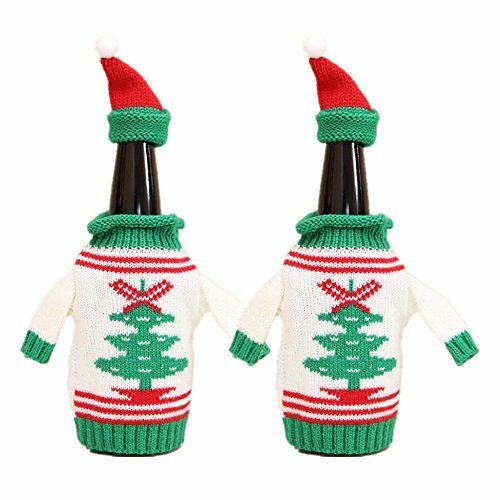 GREAT CHRISTMAS WINE BOTTLE DECORATION COVER: Christmas Wine Bottle Dress is the perfect way to dress up your wine bottle for Christmas. It is necessary for Christmas Day, highlighting the happy atmosphere of the festival. GIVE THE GIFT OF WINE WITH A SMILE: This Bottle Dress saver classes up any bottle of wine and works wonders replacing the oh-so-boring wine tags and wine labels. A QUICK AND EASY WAY TO DRESS UP YOUR HOLIDAY TABLE: Decorated with the design of Christmas deer, Snowman, Christmas tree, what more, a cap makes your dinner table funny. SUITABLE FOR: It can be used as the red wine bottle sets and thermos bottle sets. Widely used both superior hotel and home. SOFT MATERIAL: Superior high quality fabric is durable and practical, can be reused and washed. If you have any questions about this product by ZJchao, contact us by completing and submitting the form below. If you are looking for a specif part number, please include it with your message.